A CRUSHING divorce after her best friend stole her husband and the loss of her precious singing voice. Those are two good reasons why ­country legend SHANIA TWAIN — one of the ­biggest-selling stars in music — ­virtually disappeared from the entertainment industry for the last 15 years. But now the Man! I Feel Like A Woman singer is releasing her first album since 2002 and telling the full story of her traumatic time away from the spotlight. In an emotional new episode of my Bizarre Life podcast — which you can download now from iTunes or any podcast provider — the 51-year-old reveals her shock as her 17-year marriage to her producer husband MUTT LANGE broke down. Shania — who lost both her parents in a car accident when she was 21 — tells me: “I thought everything was great. I mean, I thought the worst in my life was over, basically. In a devastating twist, Mutt left Shania, pictured with me, for her best friend, Marie-Anne Thiebaud, leaving the singer understandably “shattered”. She says: “I thought that marriage was forever. I really, really believed that. I thought, ‘I’m safe. This creative relationship is forever’. And I really counted on that. “I never even considered that it would ever be different. I was committed and that would be the rest of my life. I was sure of that. In an extraordinarily happy twist, Shania is now married to Frederic Thiebaud, who was the husband of the best friend who betrayed her. But her divorce meant she was determined to be totally ­independent, both in life and her music. She explains: “I think, for me, love is a gift. It’s a necessity. But you’re still lucky if you have it, so you can’t count on it. “And I guess in that sense, that’s where my survival instincts come in. “If I had never found love again, I’m not going to lay down and die. But I’m very lucky that I did. After the break-up, Shania threw herself into bringing up son Eja, who is now 15. She says: “You know there’s a blessing in everything and taking all of those years off from the studio, off from the touring. I was enjoying being a mother. Shania’s new album Now is one that she believed for a long time would never be released. She lost her singing and much of her speaking voice after a tick caused her to contract Lyme disease. She says: “This is a specific type of tick. It more commonly attacks the vital organs. “It’s a very debilitating disease, very degenerative. So I was very lucky at all that it affected the nerves on my vocal cords, not the vocal cords. “I lost my voice for several years and I could speak but I couldn’t yell. I could never yell for my dog or my son or whatever. “I also felt that I was never going to make another album — that was probably my truth. It was devastating. I really grieved about that. It did bring me down and I struggled with it every day. “It was very depressing and I was really sad about it but I still had my writing and my writing is my first love, really, over everything. Shania spent years battling to get her voice back, which she says was “a very long, drawn-out process”. After a successful Las Vegas residency and US tour, she knew she had “no excuse but to move forward and face the fear”. Critically for her, she wrote and recorded her latest album largely on her own. Shania added: “The last thing I wanted to do at this point in my life after surviving all of that was rely on somebody else to take this huge step with me. Challenge well and truly accomplished. Shania deserves to be back in the charts. 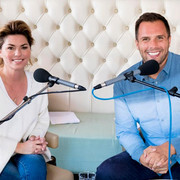 AS one of country music’s greatest talents, Shania has a queue of stars lining up to work with her – but one Irishman in particular has caught her eye. I told in May how ONE DIRECTION’s NIALL HORAN had bonded with her in the studio after meeting through their mutual producer Jacquire King. And luckily for Niall, Shania has offered to lend a hand on his debut album, which he is currently putting the finishing touches to. Shania says: “We need to write together. I think that would be a really successful, creative time. But Niall has to start returning Shania’s calls?.?.?. She laughs: “I am a little ticked with him because I texted him yesterday and he didn’t answer me. Normally he answers right away. Hurry up, Niall – you don’t want to lose that superstar collaboration. SHANIA has successfully inspired a whole new generation of singers, from ED SHEERAN to HAIM. And she is now close pals with the woman who has undoubtedly become her most famous successor – TAYLOR SWIFT. When asked if Taylor had sought her advice, she admitted: “Yes, but we won’t talk about those things. We’ve run into each other a few times over the years. Getting Shania’s seal of approval must mean so much. SHANIA’S new album Now – released in September – is a triumph of a comeback. She’s allowed me to be one of the only folk in the world over the past few weeks to listen to it and I’m convinced it’s going to be a contender for my Album of the Year. There are big Shania bangers like That Don’t Impress Me Much with a little modern dance and reggae influence for good measure. But Shania really shines on emotional ballads detailing the heartbreak of her last decade. Her new single Life’s About To Get Good is a perfect mix of the negativity of the past few years crossed with optimism about what’s to come. GIG: SHANIA has played in some of the world’s most famous venues and is currently in the midst of planning her next tour, but she won’t be returning to her most bizarre gig location. The Canadian singer admitted that it took place in “a stripper bar”.